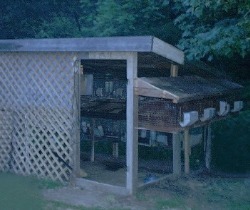 This was right after we set the old chicken coop up as a Rabbitry. We hung a unit of coops on the outside wall to the right, and it holds 8 Mini Rex. There was a drop(made from a pond liner) in front of the 8 hole unit to keep off sun, and we also capped the end. Due to the merger of Blue in the Face with Midori no Daichi, and my daughter, Hop Chocolate, finally catching the rabbit bug, we have slightly ::insert sarcasm here:: over grown our space, and purchased 48 new indoor stacking hutches for the overflow of show stock!! We are using an unfinished basement as a Rabbitry, and we have 15'x30' of usable rabbitry space. Since the temperatures do not go below 50* in the winter, we can have year round breeding to enhance our project with lighting on controlled timers. Currently there are about 60 holes in the basement, and we still have about 40 holes worth of expansion space...this is quite nice! Early September 2009, we had a concrete floor poured in the Bunny basement, fully equipped with a drain system to wash down the whole room as needed. All cages now have caster wheels, which makes cleaning, moving, and washing MUCH easier. We are fully equipped with electricity for lights, and have a dedicated outlet for the dehumidifier for the dog days of summer. We also installed a vapor barrier and full insulation to keep smells contained to the room, and the only thing we need now is a louvered fan with a timer to automatically vent the space. So far, we still need to do THAT manually!